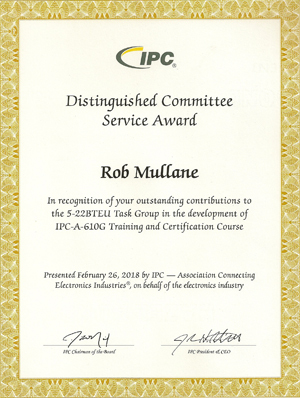 Rob Mullane of ATEK Training is delighted to receive the Distinguished Committee Service Award from IPC in recognition of his outstanding contributions to the 5-22BTEU Task Group in the development of IPC-A-610G Training and Certification Course. ATEK have secured a 10% discount on all online IPC Edge training courses. Please visit their website to see a complete range of online training modules on various topics. If you wish to purchase any of these online courses you may apply the following 10% Discount Promotional Code which is: EDGE10ATS. You do this at the checkout stage. Space Industry Skillnet is funded by member companies and the Training Networks Programme, an initiative of Skillnets Ltd., funded from the National Training Fund through the Department of Enterprise, Trade and Employment. Back to work – upskilling in Electronics manufacturing initiative! ATEK training is committed to assist any individual who is seeking employment in the Electronics manufacturing industry. ATEK are offering our full range of training courses for individuals. These courses will provide you with all the latest up to date information and technology and practical skills associated with the electronics manufacturing industry. To determine the best training solution for upskilling for a particular job application, please contact an ATEK training consultant. ATEK received "Best New Entrant" award in the National Enterprise Award, County Competition. County Manager and chairman of the Tipperary North County Enterprise Board, Mr Terry Ó Niadh presented Rob Mullane with a commemorative trophy and certificate of achievement. A judging panel choose from 6 finalists awarding marks for employment potential, marketing and financial strengths, innovation, technology, exports, environmental and business growth. Rob Mullane is very happy to accept this award on behalf of ATEK and would like to extend a special words of thanks to the Tipperary North Enterprise board for their support and contribution to ATEK since its establishment in 2004. It has come to the attention of ATEK training services that there are unauthorised IPC certificates being awarded to individuals in the Irish Electronics Industry. The worrying factor is that firstly unauthorised unregistered IPC Trainers may award them and secondly certificates are being awarded without following IPC's program policies e.g. following IPC's course structure and also the exam procedures. This is a huge concern as this may consequently lead to poor quality product and poor customer relations. The certificates now come with individual serial numbers and can be checked by IPC to identify their validity and also their origin. If you are concerned about the certification received, please contact ATEK immediately and we on your behalf will check their validation and ensure that the correct awarding of certification procedure has been followed. Remember to always ask for a copy of the IPC Trainer's own certificate prior to commencement of training of your personnel.